Building 8000 will consist of a 200 computer ACCelerator lab, classrooms, and office space. 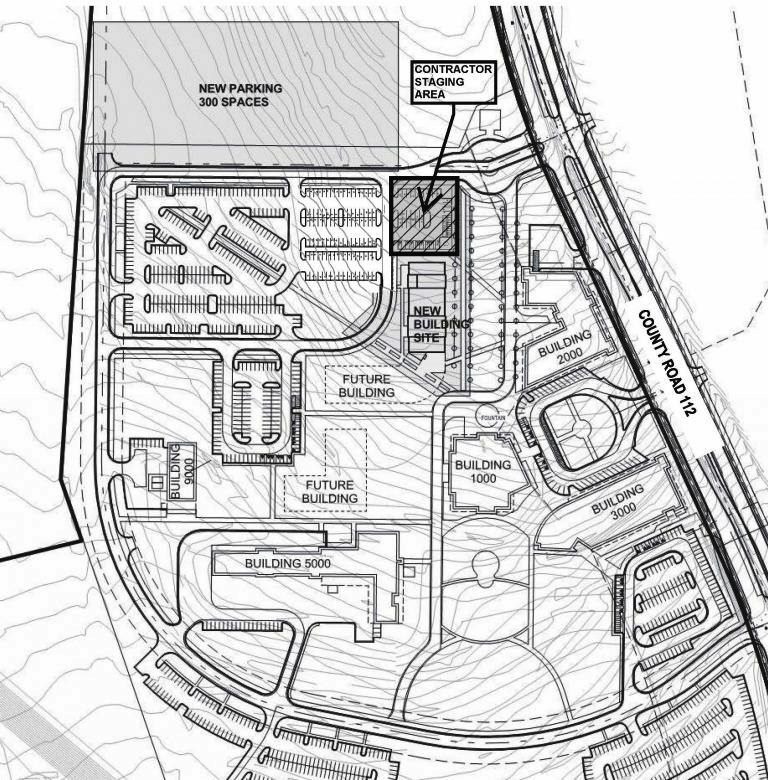 This project also includes a new parking lot on the west side of campus. The parking lot has achieved substantial completion and is open to the public. Landscaping replacement is complete. Masonry repairs are ongoing. Building 8000 has power and the ACCelerator ceiling has been painted. Interior tape, float and paint is ongoing. The parking lot is complete and open to the public. Landscaping work for additional portables is complete. The elevator is being installed. ACC and its construction partners celebrated progress at Round Rock Campus Phase 2 with a topping out celebration Friday, September 15. 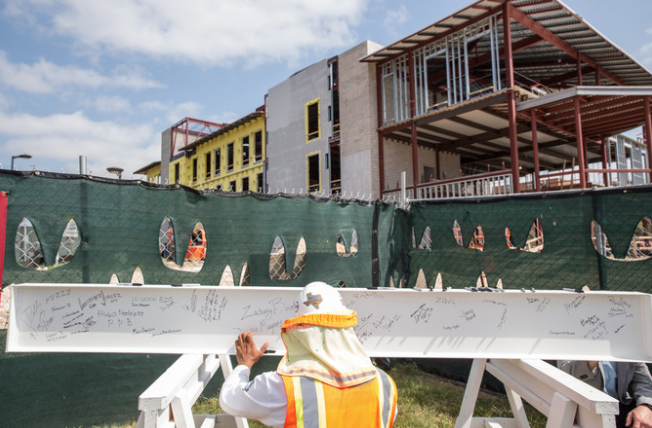 Construction crews, crafts workers, architects, engineers, and others on the project team gathered to sign a steel beam that will be placed in a stairwell of the new building. Phase 2 is expected to open in 2018. See photos from the event and a brief video. More information here. The crawlspace excavation for the new building is complete and piers have been drilled and poured. The elevator pit slab has been placed and pit wall construction is ongoing. Crews also have begun installing underground site utilities. 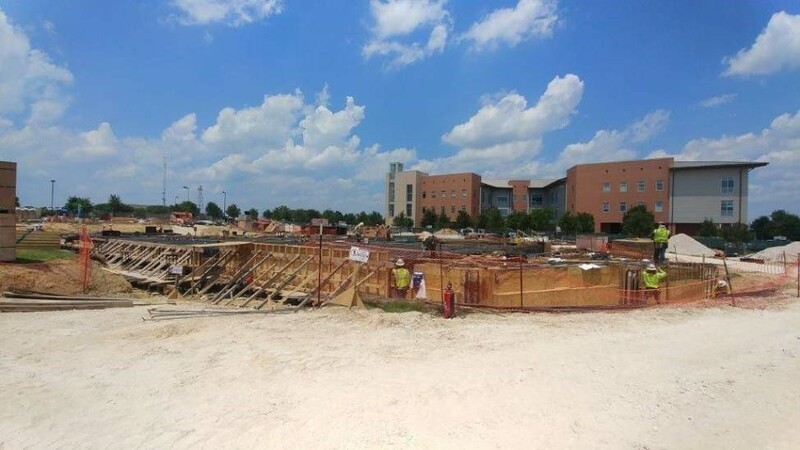 The concrete slab for the building’s first floor is scheduled to be complete by the end of June, to be followed by the second and third floor slabs. Structural steel installation is scheduled to be complete mid-August. 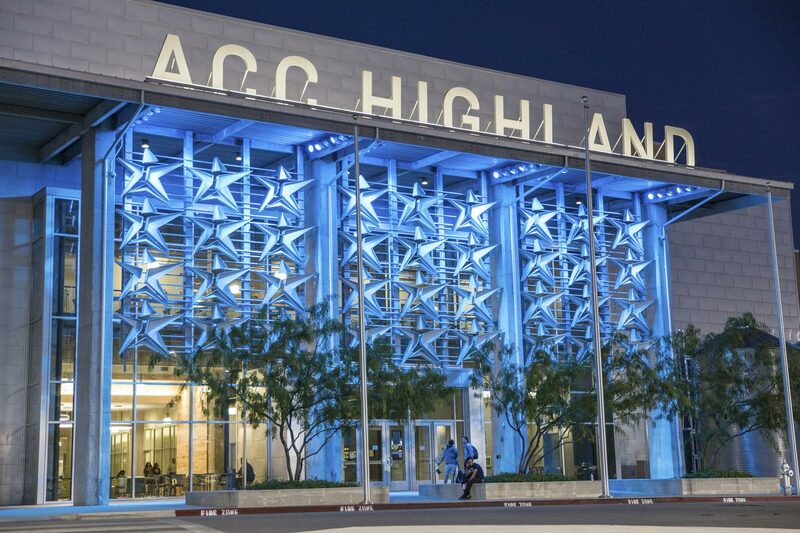 SpawGlass, the project’s construction manager at-risk, is tweeting updates about the project using the Twitter handle @ACC_RR_Phase 2. 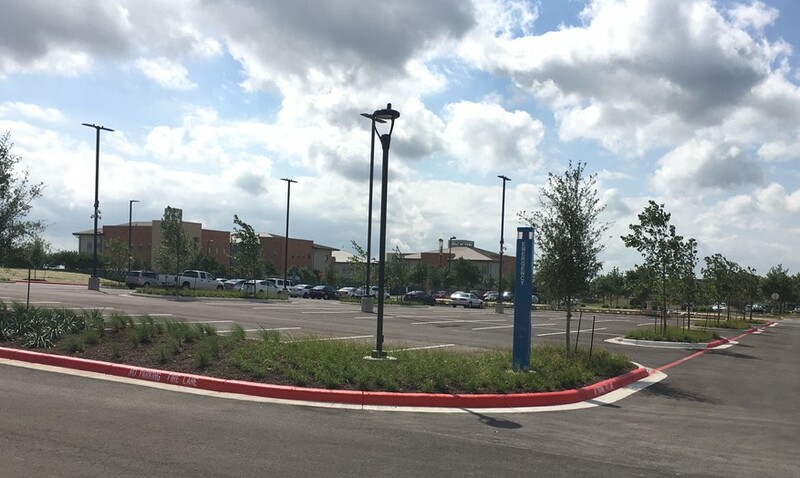 A new 301-space parking lot is now open on the north side of ACC’s Round Rock Campus (north of parking lot K). 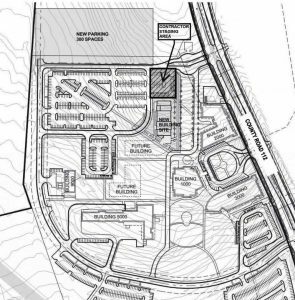 The additional spaces will ease parking congestion during the construction of a new classroom building west of Building 2000. Security cameras and emergency call boxes are located throughout the lot for safety. 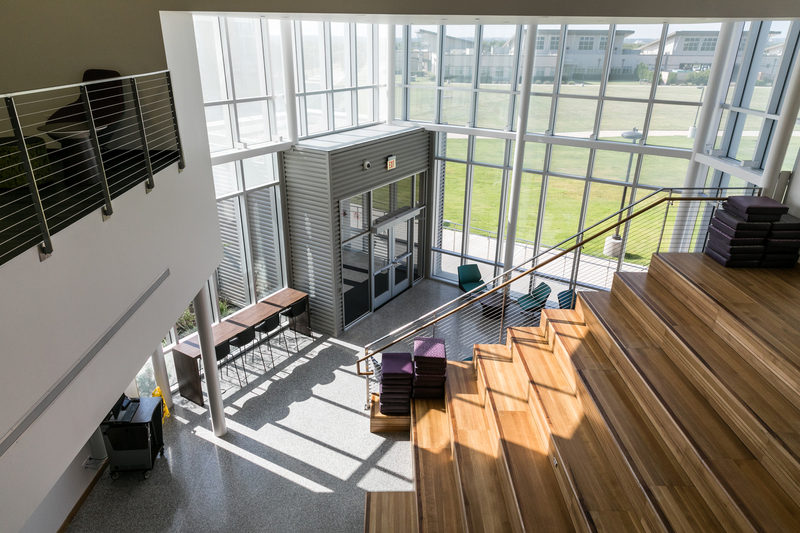 The phase 2 project includes a new general education building and renovations to existing facilities. 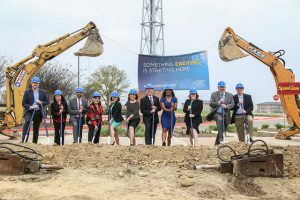 More than 250 guests joined Austin Community College at a ceremonial groundbreaking for phase 2 of its Round Rock Campus. ACC President/CEO Dr. Richard Rhodes and other guest speakers emphasized the importance of the partnerships behind the campus. 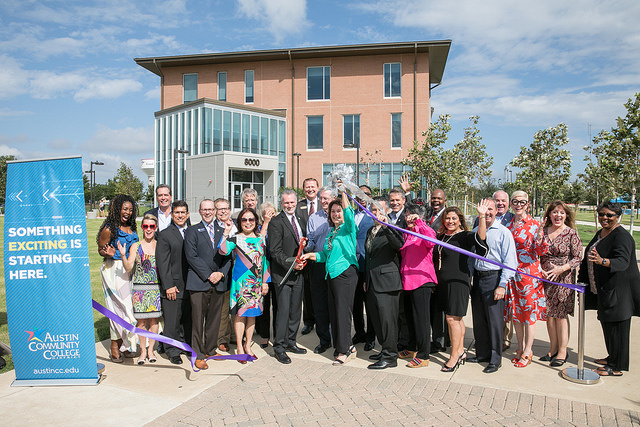 “ACC provides a vital link between schools and the business community,” said Round Rock City Council Member Writ Baese. Round Rock Chamber of Commerce President Mike Odom also said Round Rock Campus programs are a direct reflection of community needs. A campus ACCelerator will have more than 140 computer stations. 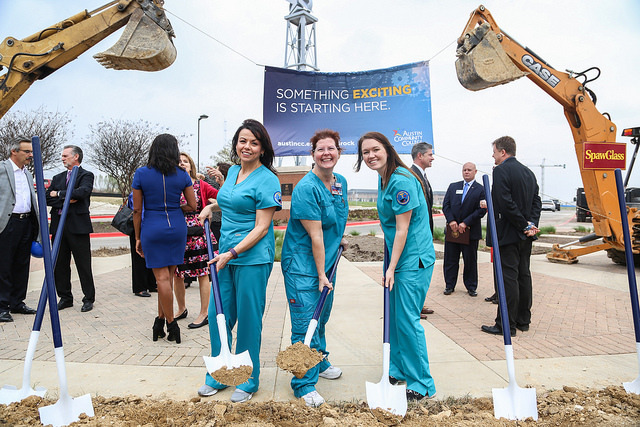 The construction and renovations will expand campus capacity by 1,000 students and add specialized facilities for programs like nursing, sonography, and surgical technology. 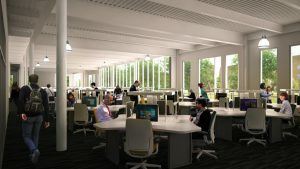 The project will add an ACCelerator lab with more than 140 computer stations for self-paced online learning supported by onsite faculty, tutors, and librarians. 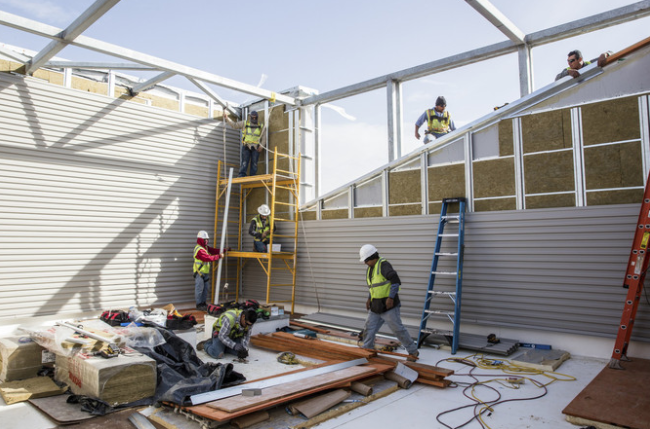 A new 45,000 square-foot general education building is scheduled to open summer 2018. 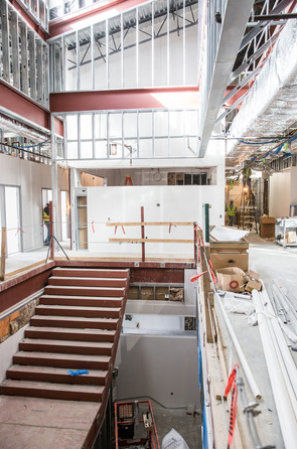 Renovations are scheduled to be complete in fall 2018 (buildings 2000 and 3000) and spring 2019 (building 1000). Austin Community College in early December begins work on a new parking lot at the Round Rock Campus. The 300-vehicle lot will be on the north side of the campus (north of current parking lot K) and will ease parking congestion during the construction of a new classroom building west of Building 2000. The new lot is scheduled to open in March, when a smaller lot will close temporarily to make room for construction. The work is one of several ongoing districtwide renovation and expansion projects.